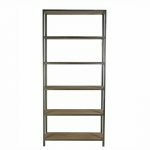 Oscar bookcase is part of our “fine vintage” collection and is an imposing simple statement big on storage and height. This great unit can sit alongisde each other to create of wall of units or solo. An industrial rustic feel to fit with all styles..